Science Fiction and Fantasy Writers of America, or SFWA (/ˈsɪfwə/ or /ˈsɛfwə/) is a nonprofit 501(c)3 organization of professional science fiction and fantasy writers. While SFWA is based in the United States, its membership is open to writers worldwide. The organization was founded in 1965 by Damon Knight under the name Science Fiction Writers of America, Inc. The president of SFWA as of 2015 is Cat Rambo. SFWA informs, supports, promotes, defends and advocates for its members. SFWA has about 1,900 professionally published writer members worldwide. SFWA Active members vote for the Nebula Awards, one of the principal English-language science fiction awards. SFWA activities include informing science fiction and fantasy writers on professional matters, protecting their interests, and helping them deal effectively with agents, editors, anthologists, and producers in print and non-print media; encouraging public interest in and appreciation for science fiction and fantasy literature; sponsoring, editing, and disseminating writings, papers, books, pamphlets, and other publications which exemplify science fiction and fantasy literature of high quality; conducting conferences, public discussion groups, forums, lectures, and seminar programs; and furnishing services connected with this stated purpose. Science Fiction Writers of America, Inc. was founded in 1965 by Damon Knight in association with a group of writers connected to the Milford Conference, which he also headed. According to Todd McCaffrey, the organization immediately "acquired great status in its efforts to help J.R.R. Tolkien get fair recompense in America for pirated sales of The Lord of the Rings." In 1991, the name of the organization was changed to Science Fiction and Fantasy Writers of America, to reflect the fact that the organization had always included writers working in multiple genres. After the name change, both SFWA and SFFWA were used as acronyms. The acronym SFWA was re-established officially in 1996. In 1982, Lisa Tuttle withdrew her short story "The Bone Flute" from the final Nebula ballot, to protest what she saw as excessive campaigning for awards and that voters did not receive copies of nominated works. Her withdrawal was sent after voting had been completed. When informed she had won, she contacted SFWA and told them she refused to accept it. She was told that her reasons for doing so would be announced. Her publisher accepted the award in her place, apparently with no knowledge of her withdrawal, and there was no mention of her objection. In September 2009, SFWA joined the Open Book Alliance to oppose the Google Book Settlement. As a party to the class action suit, SFWA had recently explained its reservations about the settlement and declared its intention to file an objection. 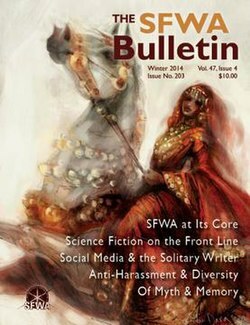 In 2013, the SFWA Bulletin was the subject of a controversy about sexism. This led to a brief hiatus, followed by a reboot of the magazine in a modern, updated format. In 2014, the original Massachusetts corporation was dissolved and SFWA reincorporated as a California nonprofit 501(c)3 organization with new bylaws. SFWA participates in various trade shows and publishing industry events in the United States and abroad, including BookExpo America, the American Library Association Midwinter Conference, the USA Science & Engineering Festival, and several major (and minor) science fiction, fantasy and media conventions. SFWA holds a semi-annual business meeting at the World Science Fiction Convention (Worldcon) when it's held in North America, and at the North American Science Fiction Convention (NASFiC) otherwise. SFWA Nebula Conference: SFWA Nebula Conference is an annual conference during which a banquet is held and Nebula Award winners are announced and presented. Other Nebula Awards Weekend events include a semi-annual SFWA business meeting and a mass autographing session for member authors, which is open to the public. In recent years, an extensive program of panels and workshops for professional writers has been offered. SFWA Nebula Conference, and the earlier Nabula Awards Weekend have been held at different cities throughout the United States. It is held in a different location every two years. It will be held in Pittsburgh, PA in 2018, the second year at that location. The SFWA Reading Series: A series of free quarterly events during which SFWA authors read or discuss their fiction with members of local communities. Currently held in Seattle, WA, Portland, OR, and Philadelphia, PA, but the program may soon expand to other areas. As an organization, SFWA acts as an advocate to effect important changes within the publishing industry, especially among publishers of science fiction and fantasy, by promoting author-friendly copyright legislation, equitable treatment of authors, and fair contract terms. SFWA sponsors Writer Beware, whose mission is to track, expose, and raise awareness of the prevalence of fraud and other questionable activities in and around the publishing industry. Writer Beware consists of the Writer Beware website, which provides the latest information on literary schemes, scams, and pitfalls; the Writer Beware blog, which provides up-to-the-minute information on specific scams and schemes, along with advice for writers and industry news and commentary; and the Writer Beware Facebook page, which posts links to articles, news items, and warnings of interest to writers, and provides a forum for discussion. Writer Beware receives the support of the Mystery Writers of America and the Horror Writers Association. Writer Beware maintains an extensive database of complaints on questionable literary agents, publishers, independent editors, writers’ services, contests, publicity services, and others, and offers a free research and information service for writers. Writer Beware staff assist law enforcement agencies with investigations of literary fraud, and have been instrumental in the convictions of several literary scammers. Griefcom, or the Grievance Committee, is formed of member volunteers who undertake to mediate writer disputes and grievances between member writers and their publishers. SFWA's Emergency Medical Fund was established to assist eligible writers who have unexpected medical expenses. SFWA's Legal Fund was established to create loans for eligible member writers who have writing-related court costs and other related legal expenses. Founded by longtime SFWA member Bud Webster, the Estate Project is now headed by Mishell Baker. It maintains a list of the estates of deceased SFWA member writers and coordinates with living member writers to make arrangements for their future estates. The Estate Project also accumulates information about authors' archives for member writers, living or dead.29. Nebula Awards: Since 1965, SFWA Active and Lifetime Active members select by vote the Nebula Awards for best short story, novelette, novella, and novel published during the previous year, where the four categories are defined by numbers of words. Damon Knight Memorial Grand Master Award: Since 1975, the Damon Knight Memorial Grand Master Award has been awarded for lifetime achievement in science fiction or fantasy. Bradbury Award: Since 1992, the Bradbury Award has been selected by a vote and presented for best dramatic presentation. Named in honor of Ray Bradbury. Author Emeritus: From 1995 to 2009, the Author Emeritus title was awarded to a senior writer "in the genres of science fiction and fantasy who made significant contributions to our field but who are no longer active or whose excellent work may no longer be as widely known as it once was." Andre Norton Award: Since 2005, the Andre Norton Award has been selected by a vote and presented for best young adult or middle-grade novel. Named in honor of Andre Norton. Kevin O'Donnell, Jr. Award for Service to SFWA: Since 1995, presented to recognize service to the organization. Named in honor of Kevin O'Donnell, Jr. in 2009 because of his exemplary service to the organization. Solstice Award: Since 2009, SFWA has presented the Solstice Award, which recognizes lifetime contributions to the science fiction and fantasy field. The award can be given to up to three people, but is usually given to one live person and one deceased person. 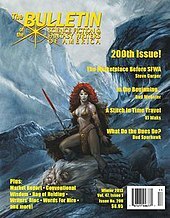 The SFWA Bulletin is a quarterly magazine that SFWA members receive as part of their membership, but it is also available (by subscription) to non-members. The Bulletin carries nonfiction articles of general interest to writers, especially science fiction and fantasy writers. It accepts submissions, for which the pay rate is 8 cents a word. The current Bulletin editor is Neil Clarke. A special issue (no. 203) published in March 2014 was edited by Tansy Rayner Roberts and Jaym Gates and "was specially created to be used as an outreach tool for conventions and other events." The issue's contents and cover were welcomed by some as an antidote to the perceived sexism of past issues though Sue Granquist felt that something looked "suspiciously like a woman in a burka". In 2013, a controversy about sexism in the Bulletin led to the resignation of editor Jean Rabe on June 5, 2013. More than 50 authors wrote blog posts in objection to comments by longtime contributors Mike Resnick and Barry N. Malzberg that included references to "lady editors" and "lady writers" who were "beauty pageant beautiful" or a "knock out", an article by C. J. Henderson praising Barbie for maintaining "quiet dignity the way a woman should", and the "exploitative" cover image of no. 200 of the Bulletin depicting a woman in a chain-mail bikini. Several authors used the occasion to speak out against sexism in science fiction genre circles more broadly. The controversy continued through Bulletin no. 202, which contained another column by Resnick and Malzberg, discussing the response to their earlier column. Their column framed that response as censorship, referring to their critics as "liberal fascists". In February 2014 a proposal to establish an advisory board to oversee content was met by a petition circulated by editor and critic Dave Truesdale supporting freedom of speech in the Bulletin. As a result of the controversy, SFWA president John Scalzi apologized to members, and the Bulletin was put on hiatus for six months. It reappeared with the Winter 2014 Special Issue, #203, but has been on a reduced schedule, publishing an average of 2 issues per year. The Forum Binary is a biannual publication that functions as SFWA's internal publication of record for members. As such, it is not available to non-members. SFWA also publishes short essays and other content relevant to writers on the SFWA Blog. Most members live in the United States but membership is open to qualifying writers worldwide. Authors, regardless of nationality or residence, must be professionally published in a qualifying market as listed by SFWA in order to become SFWA members. At present, all listed qualifying markets publish only in the English language. Active: for eligible professionally published authors in the genres of science fiction, fantasy, or horror; the minimum qualification is the sale of one novel or dramatic script, or three short stories, to venues with certain minimum circulations or pay rates. In recent years, writers may qualify using self-published and gaming credentials. Active members may attend business meetings, vote in elections, receive access to private discussion forums, gain entry into SFWA exclusive events and suites at conventions, receive SFWA publications, and may recommend, nominate, and vote on works for the Nebula Awards. Associate: for writers of science fiction or fantasy who have not yet qualified for Active membership, but who have made a qualifying sale. Associate members receive SFWA publications and access to private discussion forums, as well as entry into SFWA suites at conventions, and they may recommend and nominate works for the Nebula Awards but cannot vote. Affiliate: for industry professionals in science fiction or fantasy (such as academics, editors, agents, artists, graphic novelists, reviewers, etc.) who are not eligible to become an Active or Associate member, and organizations which have a legitimate interest in science fiction and fantasy (such as high schools, colleges, universities, libraries, and similar institutions, as well as broadcasting organizations, film producers, futurology groups and similar organizations). Estate: for the legal representatives of the estates of deceased authors who were Active members or who were qualified to be an Active member at any time during their writing career. Life: for Active members in good standing who paid lifetime dues. Discontinued new Life memberships in 2008. Senior: for Active members who have maintained continuous membership for thirty(30) years or more. Family/Group: for two or more Active, Associate, or Affiliate members living at the same address. Dues range from $90 for Associate membership up to $115 for Affiliate membership. SFWA's Board of Directors consists of the current president, vice president, secretary, chief financial officer, and five directors-at-large. ^ a b "History and Statistics". SFWA (sfwa.org). March 30, 2017. Retrieved 2007-03-30. ^ "Who We Are". SFWA. Retrieved 2014-08-08. ^ Capobianco, Michael (Winter 2014). "Copyright Battles and SFWA". The SFWA Bulletin. 26 (4): 40. ^ a b c Fiscus, Jim (Winter 2014). "SFWA Standards for Pay". The SFWA Bulletin. 26 (4): 43. ^ McCaffrey, Todd (1999). Dragonholder: The Life and Dreams (so far) of Anne McCaffrey. New York: Ballantine. p. 57. Todd McCaffrey is the son of Anne McCaffrey, who was SFWA Secretary-Treasurer 1968–1970, responsible for production and distribution of the monthly SFWA Bulletin and SFWA Forum. ^ "SFWA Forum" (124). 1991. ^ "SFWA Forum" (152). 1996. ^ "Nebula Awards". Ansible. June 1982. Retrieved 2009-08-07. ^ "Open Book Alliance". Open Book Alliance. September 2, 2009. Retrieved 2011-07-26. ^ "SFWA statement on proposed Google book settlement". SFWA. August 8, 2009. Retrieved 2015-07-16. ^ a b Flood, Alison (June 12, 2013). "Science fiction authors attack sexism amid row over SFWA magazine". The Guardian. Retrieved 2013-06-17. ^ "Entry on the Science Fiction and Fantasy Writers of America," The Encyclopedia of Science Fiction, accessed March 30, 2017. ^ a b Silver, Steven H (Winter 2014). "SFWA Annual Events". The SFWA Bulletin. 26 (4): 59. ^ Silver, Steven H (Winter 2014). "The NY Reception". The SFWA Bulletin. 26 (4): 60. ^ "SFWA Pacific Northwest Reading Series," Science Fiction and Fantasy Writers of America, accessed March 30, 2017. ^ "About Writer Beware". SFWA. 1998–2013. Retrieved 2014-11-02. "Except for graphics, and where specifically indicated, all Writer Beware® contents copyright © 1998-2013 Victoria Strauss." ^ Sargent, Betty Kelly (January 6, 2014). "Indie Author Beware". Publishers Weekly. Retrieved March 28, 2017. You don’t have to be a genre writer to benefit from this excellent site and its Writer Beware blog. Its mission is to “track, expose, and raise awareness of the prevalence of fraud and other questionable activities in and around the publishing industry.” They say that they “maintain an extensive database of questionable literary agents, publishers, independent editors, writers’ services, contests, publicity services, and others.” If you have a complaint about a company you have worked with or a question you can email them at beware@sfwa.org. ^ Schudel, Matt (September 7, 2013). "A.C. Crispin dies at 63; author of sci-fi and tie-in novels". Washington Post. Retrieved March 28, 2017. Ms. Crispin served 10 years as eastern regional director of the writers’ group and helped found the watchdog committee called Writer Beware in 1998. Writer Beware is a group that alerts people to online scams of would-be agents and publishers, seeking to entrap and defraud would-be writers unfamiliar with the publishing world. Ms. Crispin helped uncover hundreds of cases, testified in court, and assisted the FBI and prosecutors in sending several scam artists to prison. ^ "SFWA Emergency Medical Fund". Science Fiction and Fantasy Writers of America. Retrieved 25 December 2016. ^ Clough, Brenda W. (Winter 2014). "The Estates Project". The SFWA Bulletin. 26 (4): 13. ^ "Nebula Award rules," Science Fiction and Fantasy Writers of America, accessed March 30, 2017. ^ "About the SFWA Grand Master Award". The Locus Index to SF Awards. Locus Publications (locusmag.com). Archived from the original on 2011-08-05. Retrieved 2011-07-26. ^ "SFWA Grand Master Award Winners By Year". The Locus Index to SF Awards. Locus. Archived from the original on 2011-08-05. Retrieved 2011-07-26. ^ "Ray Bradbury Award". Locus Magazine. Archived from the original on 2011-06-05. ^ "Introduction to Author Emeritus Neal Barrett, Jr.," The Nebula Awards Showcase 2011 edited by Kevin J. Anderson, Tom Doherty Associates, 2011, page 101. ^ "Honoring Andre: The Andre Norton Award" by Josepha Sherman, Nebula Awards Showcase 2007 edited by Mike Resnick, Penguin, 2007. ^ "Armstrong Wins SFWA Service Award," Locus Magazine, April 28, 2014. ^ "About the Other SFWA Awards". The Locus Index to SF Awards. Locus. Archived from the original on 2011-10-16. Retrieved 2011-07-26. ^ "SFWA Announces New SFWA Bulletin Editor - SFWA". 25 January 2016. ^ Gates, Jaym (February 27, 2014). "SFWA Bulletin Returns". SFWA. Retrieved 2014-03-29. ^ Sanford, Jason (March 26, 2014). "The new SFWA Bulletin is blowing my mind". Jason Sanford (jasonsanford.com). Archived from the original on May 17, 2014. Retrieved 2015-07-16. ^ O'Neill, John (March 3, 2014). "The Return of The SFWA Bulletin". Black Gate: Adventures in Fantasy Literature (blackgate.com). Retrieved 2015-07-16. Comment by Sue Granquist (March 5, 2014): "That “fantastic piece of cover art” looks suspiciously like a woman in a burka. ‘Nuff said.."
^ a b Anders, Charlie Jane (June 6, 2013). "The editor of SFWA's bulletin resigns over sexist articles". io9. Retrieved 2013-06-07. ^ a b Griner, David (June 4, 2013). "Will the Fantasy Genre Ever Grow Up and Ditch the Chainmail Bikini? Industry bulletin's cover sets off firestorm". Adweek. Retrieved 2013-06-07. ^ Romano, Aja (June 7, 2013). "SFWA sexism rocks the science-fiction blogosphere". The Daily Dot. Retrieved 2015-07-16. Last updated February 25, 2014. ^ Resnick, Mike; Malzberg, Barry N. (Summer 2013). "Talk Radio Redux". The SFWA Bulletin. 47 (3): 45–50. Archive copy retrieved 2015-07-16. ^ Romano, Aja (10 February 2014). "Controversial email inflames sexism debate in sci-fi community". Retrieved 21 September 2016. ^ Scalzi, John (June 2, 2013). "Presidential Statement on the SFWA Bulletin". SFWA. Retrieved 2013-06-17. ^ "Plan for Moving Ahead with the Bulletin". SFWA. June 13, 2013. Retrieved 2013-06-17. ^ a b "Membership Requirements". SFWA. Retrieved 2018-02-27. Effective with Bylaws May 1, 2015. Updated July 1, 2017. Previous membership requirements available. ^ SFWA Board, Science Fiction and Fantasy Writers of America, accessed February 27, 2018.